When you are updating a space or maybe it’s your first home, new seating is a key piece to any new space! Finding the perfect sofa that’s comfortable and attractive is a challenge - So I have put together this guide for some of the best sofas on the market. I have done all the homework too! Looks, price and customer reviews. Here’s my top picks! I am always sourcing for clients and researching new products. Everything is based on quality appearance and price. These sofas I would choose for my own home. Second runner up and On My “Need this so bad in my life” list is the Sven by Article. Not only are the lines clean, crisp and modern, It’s has a classic mid-century feel. This sofa features a tufted bench seat, two stuffed back cushions and two matching round bolster cushions to complete the look. The reviews on this sofa are very impressive. Measuring in at 88'“ x 38” x 34” There are a total of 70 different pieces in the Sven line with an endless amount of swatches to choose from. Go see what everyone is raving about and check this out for yourself. 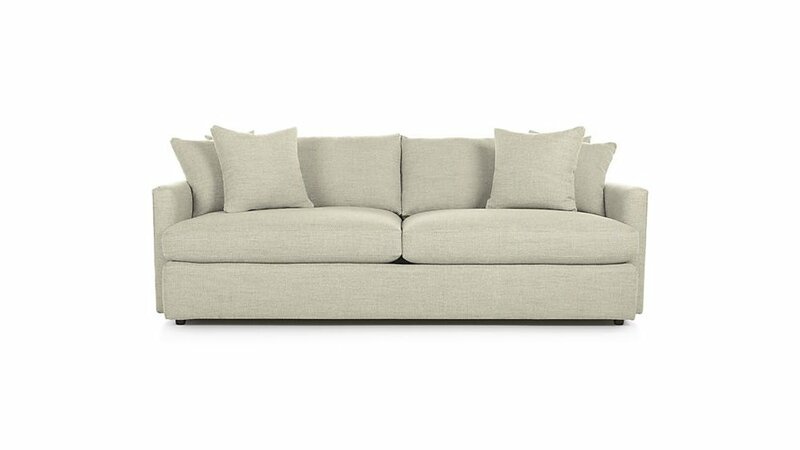 The third contender is The Harmony Down Filled Sofa by West Elm. This sofa has deep, comfy seating, with a choice of seat depth! Yes you can choose between 41” or 47”, giving it a sink-right-in quality. (82"w x 41"d x 34"h) Lots of good reviews about quality on this one. This collection has different sizes available and again lots of great swatches to go with any style and décor! Great contender in my books. Poshy and Pretty the beautiful Mina sofa by Anthropologie has really good reviews! Featuring the tufted seat and back, this sofa comes in swatches that have 10 fabrics and 2 leathers. The Mina comes in two sizes, this one measuring 68” x 79” x 94” With it’s modern lines and classic appeal the Mina is perfect and has high style! This is currently a personal favourite. The Grammercy Moon Grey Sofa features family friendly fabric in this Bennett Moon, or Matte Black. Clean simple lines makes this choice a flexible style. With the black Iron base it keeps it casual and chic! 1. Hardwood construction is key. Ensure it’s made with kiln-dried oak, beech or ash are long lasting options. 2. Invest in good quality fillings. A common cushion filling is Polyurethane foam. It’s durable and easy to care for. Be selective with your choice: Foam that is too dense can feel hard and uncomfortable. and foam that is too soft can deteriorate quickly with everyday use. For the cream of the crop the best choice is high-resilient foam wrapped in a down feather combo. It’s long lasting and worth every penny. 3. Choose durable fabrics. Sofas in Cotton or Linen fabric, and Leather sofas are a popular upholstery materials that are worth investing in. Synthetic materials like microfibre are also a great choice and long lasting. A fabric with a small-scale pattern or woven texture are great for hiding dirt AKA kid friendly! Yay! Think about your lifestyle, do you have kids, pets? Then choose a fabric that will work for you. 4. Size matters! Make sure to measure twice! I always measure the doorways and hallways as well. This will be a big investment. Make sure not only it will get through the door but it will fit and look good in your space. There you have it! Hope you enjoyed and this helps you choose what works for you and your lifestyle. I had a lot of fun hanging out and sourcing for you! I plan to make this a series and feature some more products! Comment below if you would like me to post about something special? So please hit that subscribe button and I will see you next time!!! This post was not sponsored. However all opinions are my own. I love sharing what is true to my style and thank you for your support!